The Chinese company reports that it should sell 200 million handsets by the end of 2018, which would bring it fairly close to Apple's target. At this rate, Huawei is expecting to overtake Apple in global sales at some point in 2019. The US and Indian markets should help Huawei further their plans in this respect, although the US embargoes could hinder this development. Huawei is one of the fastest growing smartphone makers on the market right now. The Chinese company is looking to expand into new markets, including the US one, which, by the looks of it, will be slowed down due to the US embargoes. Nevertheless, Huawei is confident that its sales will soon match and even overtake those reported by Apple. According to SCMP, Huawei’s mobile executive director Richard Yu Chengdong recently stated that the company is well on track to reach 200 million handset sales by the end of 2018, which is very close to what Apple has been recording each year for the past few years. At this rate, Huawei is expecting to overtake Apple’s yearly sale by the end of 2019. Huawei already surpassed Apple’s sales for the second quarter in 2017, but this happened before the launch of the iPhone 8/X models, so overall 2017 sales were still significantly higher for Apple. 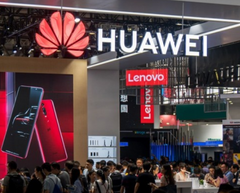 It should be noted that Apple only releases a few new models each year and still manages to reach the 200 million target, while Huawei releases considerably more models per year, including models from the Honor brand. The most promising markets for Huawei are the US and the Indian ones. While the US market will be hard to steal from Apple, the Indian one looks like it could easily be dominated by Huawei, as Apple only managed to sell only 1 million handsets there throughout 2018. Also, due to lower price points, Huawei can sell more handset on smaller markets like the East-European ones. If Huawei manages to surpass Apple, it would then need to set its standards even higher in order for the company to reach the first position and dethrone Samsung.